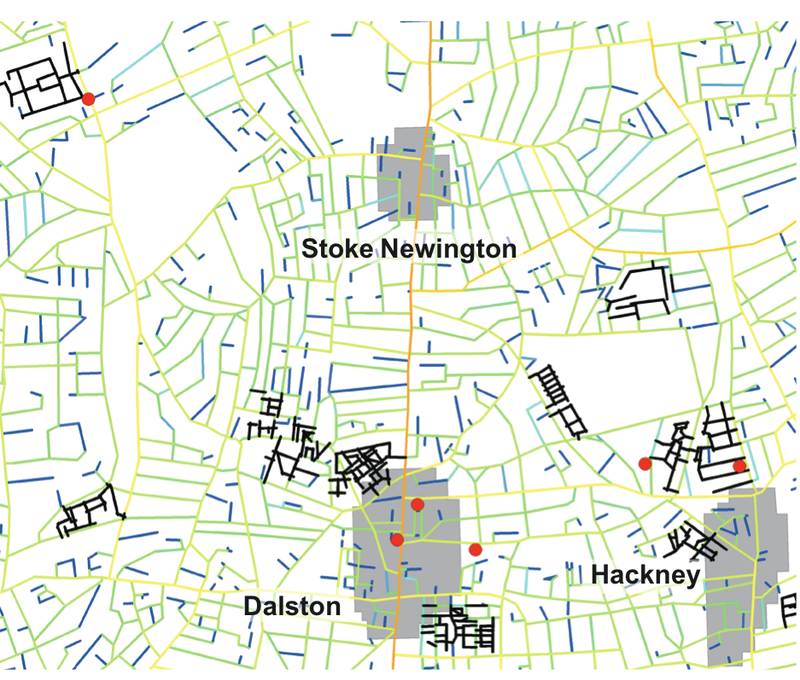 My colleague Adam White from GroupShot just shared an interesting location analysis study of the recent London riots. The study was carried out by the group Space Syntax and is available here (PDF). The purpose of the study was to test whether the overly complex spatial layout of large post-war housing estates has “an effect on social patterns, often leading to social malaise and anti-social behavior.” While the study’s methods are interesting, I’m concerned about some of the underlying socio-economic assumptions that buttress the analysis. 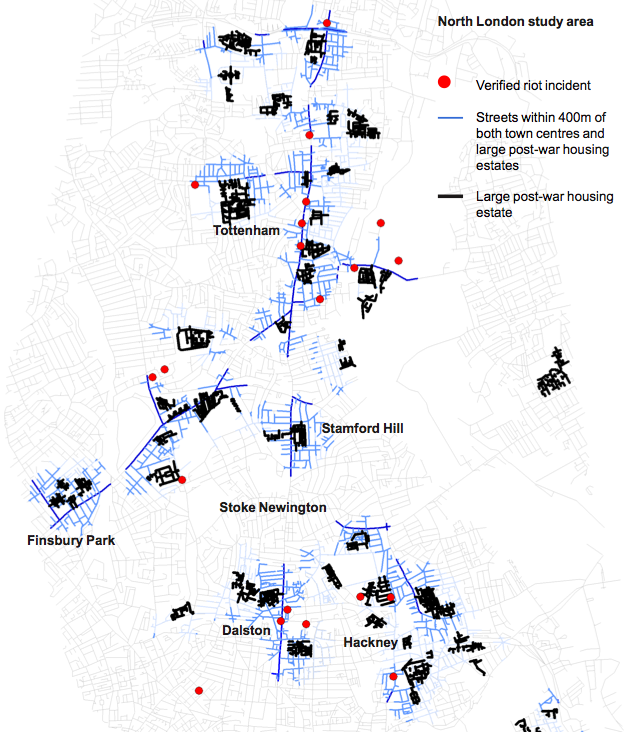 According to the study, 84% of verified incidents in north London and 96% in south London took place within a five minute walk—400 meters—of both: 1) An established town centre, and 2) a large post-war housing estate. Meanwhile, local centres without large post-war estates nearby were unaffected. The reason I’m uncomfortable with the above has to do with the implied solution, i.e., simplify the complex spaces and bring more social traffic to under-utilized areas. This will ensure that children and teenagers are more supervised and prevent peer socialization from taking place without the influence of adults. In other words, simply replace the “hardware” so the “social software” won’t have any more bugs. Snap, if only Mubarak could have hacked Tahrir Square before the revolution. Sarcasm aside, there were some real and legitimate grievances that motivated some of the protestors in England (and Egypt), which this study doesn’t address. This entry was posted in Crisis Mapping, Digital Activism and tagged Anaysis, London, Riots. Bookmark the permalink. Hmmn. Had a quick look at the report and compared them to the Hackney ‘ward profiles’ which include maps of social housing estates in each ward. Unsurprisingly there are a number of additional estates of some size that do not feature on the Space Syntax maps. I assume these either do not meet some sort of criteria for being ‘post-war’ and ‘over-complex’ but for example the Somerford Road and Yorkshire Grove Estates in Stoke Newington are not included and the latter is close to the town centre. Point is some degree of selection of data is involved in this sort of spatial analysis and that inevitably enrolls assumptions that in turn have a determining role in data selection. For example, as you say, mapping socioeconomic data should have come first (tho in itself that assumes certain things). Again a quick perusal of the ward profile info suggests Stoke Newington has a notably greater proportion of ‘owner occupiers’ in that ward than is typical for Hackney (about 12% higher). Again not an explanation for the location of riots (selection of “riot” location by “verified incidents” (looks remarkably like the google map of same) is also a problem) but suggestive that other factors than type of housing estate may be at play. Many thanks for this, seems like the study is rather suspect all around.